An expensive bed pad - but worth every penny! 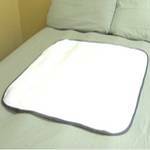 The Wunderpad Bed Pad will hold up to 40 ounces! 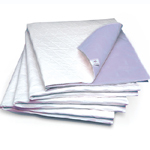 The Wunderpad Bed Pad was designed to be washed and dried in standard and commercial laundry machines. The barrier material will not melt - even in the hottest dryers. Wunderpad Bed Pads are a great way to reduce the time and effort required to change out the entire bedding if there is an accident. You can use Wunderpad bed pads on top of the sheets and secure them with the corner stability loops. 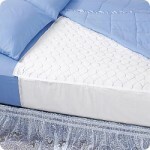 In addition, you can rest assured that if there is an accident, the bedding will not be completely soaked.